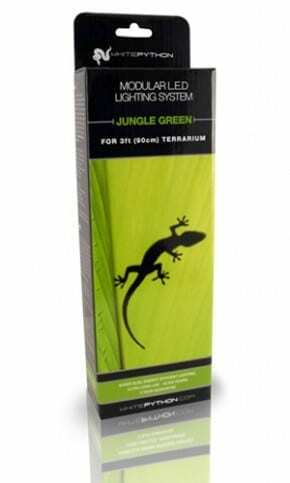 The ideal choice of light for Jungle or Rainforest dwelling reptiles that require low level, natural daytime lighting. The new Jungle Green LED Lights at WhitePython™ offer a totally unique and modern concept to keeping Jungle or Rainforest dwelling reptiles. The low wattage lights are designed to replicate natural sunlight after being filtered through the green leaves of a Jungle canopy. For those who wish to have a slightly brighter, but still green light we recommend using the WhitePython™ Daylight White light system in conjunction with the green lights. Unlike other lighting systems, the LED modular systems can be installed in a matter of seconds. With it’s simple magnetic tape fixing, you can position the lights in the desired area without the need for any screws or fixings. What’s more, with it’s innovative auxiliary fittings, there is no need for unwiring plugs to poke the leads through the back of the terrarium. To see how simple this system really is, watch the installation video by clicking here. Important: Does not emit UVA or UVB. Also available in Daylight White, Nightlight Red and Moonlight Blue. Each Kit contains an 18W transformer with plug, wires and connectors, mounting magnetic tape and sufficient numbers of LED light strips. This kit may be extended at any time by purchasing separate LED strips. 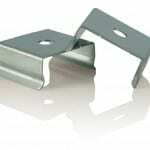 Also available, LED Metal Clips for extra rigidity. Particularly useful if using these lights with arboreal snakes or larger lizards such as Monitors or Iguanas. Also recommended if using in high humidity environments, dusty environments or where surfaces may not be 100% flat, such as some melamine wood surfaces. Available at all good WhitePython stockists.